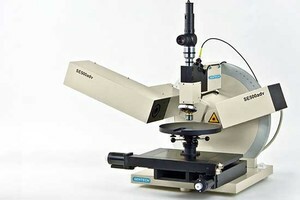 The stabilized HeNe laser guarantees a precision of 0.1 Å for thin film thickness measurement of ultra thin single layers. The multiple angle manual goniometer with superior performance and angle accuracy of thislaser ellipsometer allows measuring refractive index, extinction coefficient, and film thickness of single films and layer stacks. The measurement speed of our laser ellipsometer SE 400adv enables the users to monitor single film growth and endpoint detection or to map samples for homogeneity. The laser ellipsometer SE 400adv can be utilized to characterize single films and substrates from selectable, application specific angles of incidence. 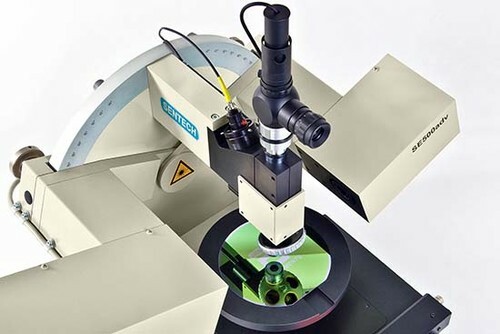 The auto-collimating telescope ensures precise measurement on most kinds of absorbing or transparent substrate with a flat, reflective surface. 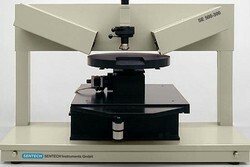 The fully integrated support of multiple angle measurements (40 ° – 90 ° in steps of 5 °) can be used for determining thickness, refractive index, and extinction coefficient of layer stacks. 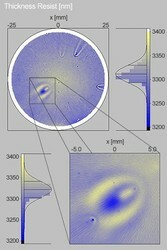 Multiple angle measurements are also applied for absolute thickness measurement to compensate the ambiguity of thickness measurement in laser ellipsometry. 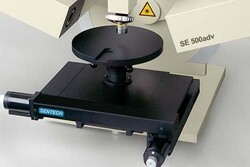 The SE 400adv is the SENTECH laser ellipsometer for thickness measurement of ultra thin single films. The compact table top instrument comprises the ellipsometer optics, goniometer, sample platform, auto-collimation telescope, HeNe laser source, and detection unit. The options of our laser ellipsometer SE 400adv support applications in microelectronic, photovoltaic, data storage, display technology, life science, metal processing, and others.